take on a real underdog, President Barack Obama. What? Wait a minute. Guys, is this right?" Well, yes and no. The season opener is tonight. It will include Green Bay. But they will be playing New Orleans. The Saints won the Super Bowl the year before. Barack Obama has never won a Super Bowl. In fact the only cup he has is his athletic supporter. But they will both be on TV tonight. 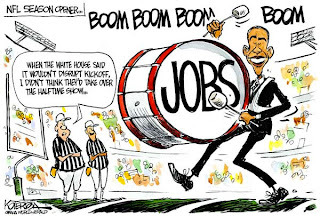 Um, Obama and football. Not Obama and his cup. 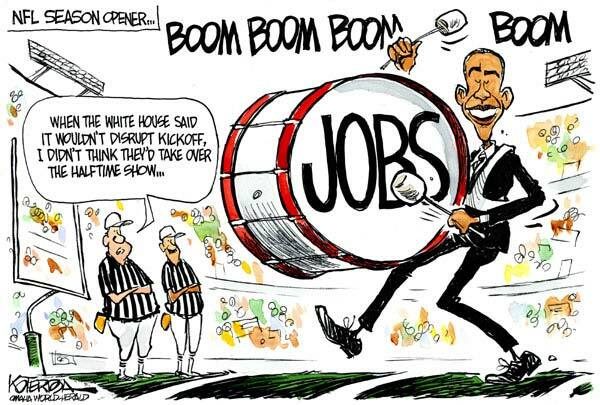 The President was to have made his so-called "jobs speech" to a joint session of Congress Wednesday. But I think Congress preferred to watch America's Got Talent last night (for some pointers, perhaps) because they said they weren't available and could he please come back Thursday. Fine. Except Thursday - today - will interfere with the NFL's season opener. A compromise was reached and now the President will address Congress - and the nation - an hour before kick-off. Now I'm a Canadian and I don't quite get the American political landscape. But this little quagmire really helps me get a grip on things. You see, to start with, many Americans have been on the sidelines for some time now. Obama's bench strength hasn't been great. More often than not he's been pummelled by his opposition. I don't know that it's entirely his fault but when things appear to go wrong his defense is weak. The opposition has many interceptions to their credit, even though they've often been charged with pass interference. Quarterbacking his team hasn't been easy. Often there've been fumbles. And more often than not, the Democrats seem to blow a fourth and goal situation. Sadly, fan support is down considerably. Republicans have been quick to call his efforts offside. Although he thought himself an able leader of his team sometimes players like Hillary Clinton, one of his wide receivers, go off in different directions. And if things keep going the way they are, he may not be back to play in the second half. Dammit, Hillary. I said button hole LEFT! Who knew it could aid in explaining, in simple terms, just what's wrong with America! Clever post! And funny too. Too many people to please in this country. I'm thinking more and more about Costa Rica. Stable govt. Neutral. And....SOCIALIZED medicine! Sounds like the ticket for me! I've been to Costa Rica! Loved it. Hot. But the beaches are fabulous. How are you doing these days, health-wise? Got everything under control? "Now I'm a Canadian and I don't quite get the American political landscape." I'm an American and even I do NOT get the American political landscape! Wow. It's that complicated, eh? So then I guess my analogy was helpful? 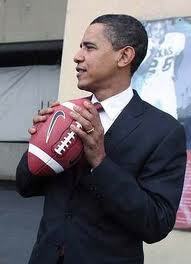 To sum up, would you say Obama often drops the ball? Ha! Well done sir. I have a feeling his whole campaign is going to be a Hail Mary play. Oh, good one, Nicky. Wish I'd thought of that. Let's see. Stop giving tax breaks for companies that take their employee base to other countries. Stop using tax money for every stupid, grass roots based, feel good ideas. Actually tax us wealthy like everyone else and close the loop-holes. Don't spend Government money to try(and fail) to protect Intellectual Property rights, the law say's that a company has to protect it's own stuff. Don't give breaks to a company and say "please" to create jobs. Stop having "Absolute Values" that are "Bend Over" policies. Go represent you real constituents and not the people who fund your campaign. Get reps to spend a bit of time to represent their neighbors and not care if they have to go back. An elected rep should be happy that they did their time and got back to work. Holy crap. You should run!